Mayo Association Dublin was delighted to recently present a cheque for €10,000 to Martina Jennings, CEO of Mayo Roscommon Hospice Foundation – our charity partner for The Yew Tree Ball 2019. 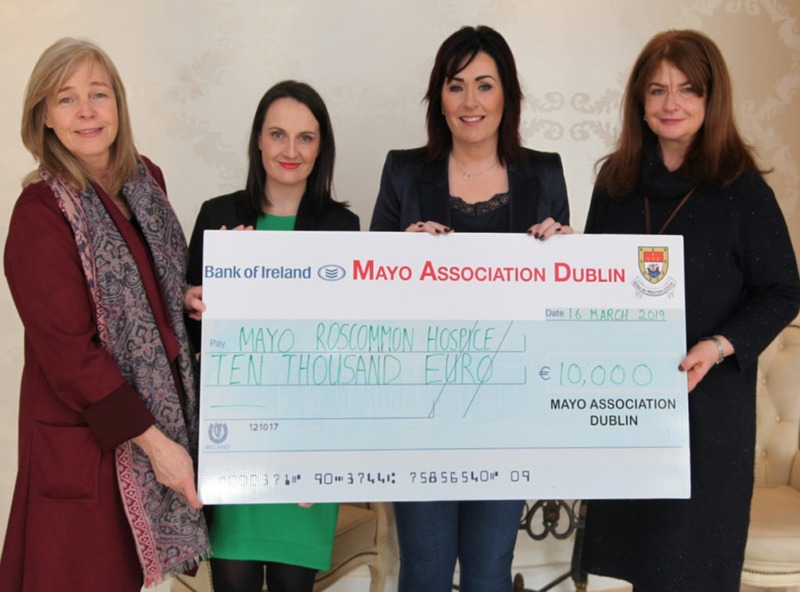 Mayo Association Dublin’s Mairead Fleming, Julie Doyle and Grace Heneghan presented Martina Jennings, CEO of Mayo Roscommon Hospice (third right) with the cheque for €10k in Castlebar on 16 March. Having raised over €8,500 from our Bumper Raffle on the night of the Ball (Saturday 9 February at Dublin’s Ballsbridge Hotel), our Executive Committee rounded this off to €10,000 to donate to this very worthy charity, which is due to open the doors to the West of Ireland’s first palliative care unit in Castlebar in June, with a second unit to open in Roscommon Town in early 2021. With the first state-of-the-art 14-bed hospice unit due to officially open in late June in Castlebar, Martina Jennings said they’re delighted that this dream is now becoming a reality. 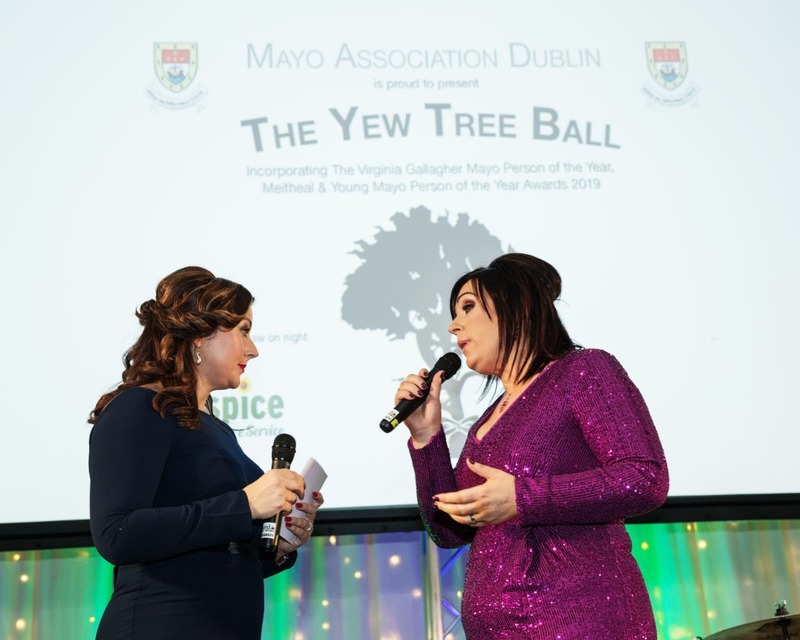 Here’s the video presentation of the new unit at our Yew Tree Ball, before Martina then spoke to Angelina Nugent, our MC for the night, about their ongoing work in providing vital palliative care services in the west. .”The only unit of its kind here in the West of Ireland will be built completely from fund-raised revenue. 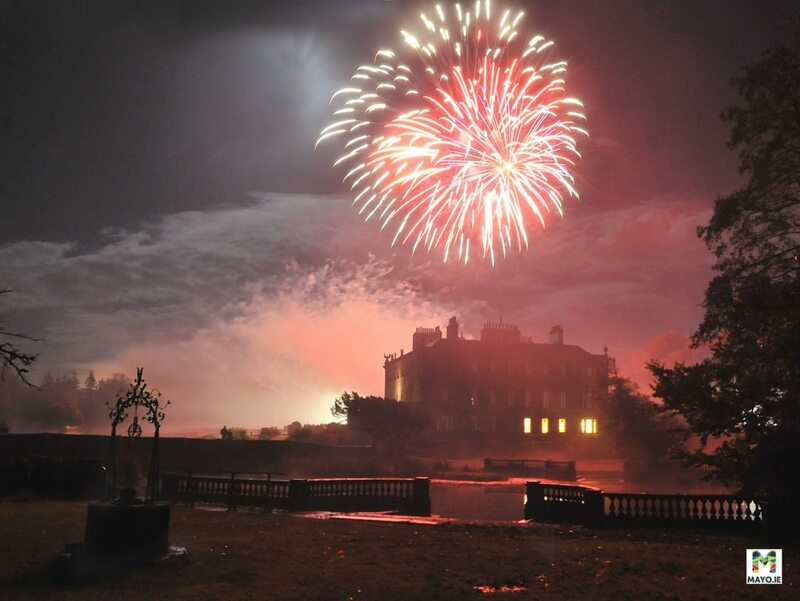 The cost of completion is projected at €10 million and, although it is a huge challenge for our little organisation, we will see it through to completion on schedule and on budget,” she added. Martina said that as soon as the Castlebar Hospice Unit is complete, building works will start on an eight-bed Specialist Palliative Care Hospice in Roscommon (beside Roscommon County Hospital). “Again this project will be built solely from fund-raised revenue and is due to come in at cost of €5 million. These units are an absolute necessity for the people of Mayo and Roscommon and the sad reality is that if our Foundation does not commit to building these state-of-the-art units, it simply would not happen,” she added. As well as funding the cost of these two units, Mayo Roscommon Hospice Foundation will continue to fund the Palliative Home Care Service across the region, at a cost of €1.2 million annually. “This is a vital service in the local community and one of which we are so very proud,” the chief executive pointed out.